There used to be a character in the comic strip Get Fuzzy who thought all the world's problems could be solved with a hug. The portly, friendly cat was really annoying to Bucky, the resident misanthropic feline, and a bit overbearing to the sidekick ferret. Notice their less than exuberantly joyous expressions. It occurred to me, out of the blue, that to my cat Fiona, I am Chubby Huggs! Not only is there a striking resemblance between me and Chubby, but Fiona sure looks a lot like Bucky whenever I try to hug her (check out her eyes--priceless!). Now, I only held her that way to emulate the graphic, but she just does not like to sit on my lap or be held. At all. Which I try to respect. So I hug her about 10% of the time I want to, but to her that's about 90% too often. I sure am brave--or stupid--to post this photo! Cute picture! Want to trade cats? I have one that wants to be held all the time and most of the time when I am using my laptop, she lays on my arm while I am trying to type-or she is laying on my feet. 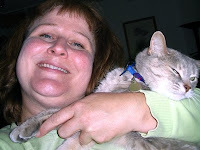 Beckie, LOL, my other cat, James, is attached to me by an invisible 10-foot lead. He also loves to lay on my "mouse" arm when I'm using the computer. Grin, I think you're brave and it's a fun pic. Some cats don't want to be hugged, others can't be hugged enough. I'm lucky that I have several who love to be hugged most of the time. My Delia also loves laying on my mouse arm which tends to put my arm to sleep. Cheers is like that. If I hold her she is pushing on me all the time to get down. When I'm sitting, she wants to be in my lap but not held tightly. The funny thing is, she was like that as a tiny, tiny kitten. 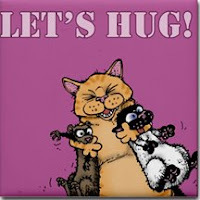 Obviously, those silly cats don't know that all the world's problems can be solved with hugs. ~FUZZY!~ What cat loves our giant size squeeze and hugs!! Not mine that's for sure but I manage a 3 second hug when I can. Now when my Paisley wants to sit on my lap...well that's another story...always affection on their terms!! Monica, if looks could kill. . .
Ein bißchen schmunzeln mußte ich ja schon beim Vergleich der beiden Bilder. Aber, da Du es ja selber nicht ganz bierernst nimmst, darf ich das ja, nicht wahr!? Die Steigerung wird dann, wenn die Katze mal Dich in den Arm nimmt!